Even as content marketing has assumed greater adoption in the B2B industry today, it still hasn’t been able to solve one of the most perplexing challenges content marketers face on a daily basis. The challenge is many of them are not really sure what kind of content they should produce to address the concerns of their niche audience. As a result, they simply create and distribute content as a part of their content calendar, not knowing whether it’s helping their overall content marketing objectives. Moreover, creating “more content” is just adding to the noise unless it adds any value to your niche audience and the content marketing strategy as a whole. If this sounds familiar, content intelligence can help solve your problem. Content intelligence is a form of marketing technology which allows you to understand the content in its entirety — what’s it about, how it speaks, what emotions it calls to mind and so on. The emergence of big data and artificial intelligence has made B2B content marketing more complex, making it necessary for content marketers to understand the full context of their content strategy. Content intelligence can help content marketers not only make better decisions about content strategy but understand consumer data better. In short, content intelligence captures consumption-critical data about your target audience and offers actionable insights you can use to predict your future content strategy. Let’s delve a little deeper and understand how content intelligence can help improve your content marketing strategy. Creating a great piece of content is one thing but helping it match its target audience is quite another. More often, content marketers follow their intuition rather than data in order to decide on their content distribution strategy. However, without being data-driven, such decisions fail to generate any traction from the audience. While over four million blog posts are published every day, according to Buzzsumo, fifty percent of them get eight shares or fewer. Content intelligence solves this problem by characterizing each piece of content based on its previous interaction history. Taking into account the interactions and consumption data, it helps you find out what content is a best-fit at a particular phrase of your content distribution strategy. Such informed decisions will also help you automate your content distribution strategies and meet your overall content marketing objectives. Content personalization is one of the main reasons why Netflix, Spotify, and Amazon are some of the household brands today. When a consumer visits those websites, they get to see content that is tailored to their personal tastes based on their previous browsing history. In a B2B context, however, consumers barely get such personalized content pieces when they visit a website. According to a survey by Infosys, 74 percent of customers feel disappointed when they don’t get any personalized content. In fact, a study by Rapt Media found 62% consumers would be more likely to purchase from a brand if its content was more valuable, interesting, relevant and personalized. When content intelligence is applied to your website, your visitors will see stories based on their previous browsing history, their position in a company and content consumed by them in the past. Content intelligence factors in hundreds of signals to determine the accurate content pieces for specific audience segments. In short, content intelligence will ensure effective utilization of your existing content inventory. This will translate to higher engagement and more brand loyalty. Even as content marketers have a huge inventory of content they’ve built over the past years, most of the content is stale and ineffective. This affects their potential to make an impact on the target audience. Wouldn’t it be nice if there was a platform which could suggest necessary changes to update your content inventory? Well, that’s what content intelligence platforms are designed to do. They analyze your content inventory, browsing history of your audience, engagement metrics, and suggest specific ways to improve your content pieces based on predictive analytics. Content intelligence even suggests when to update your headlines, images and practically any element that can improve user experience and add value to your existing content inventory. By updating your content throughout the funnel stages, you can better nurture your leads and prospects. Building content based on your audience taste is an effective content marketing strategy. However, predicting what content your audience will like is really hard. In fact, many content marketers suffer writer’s block which affects their content quality and schedules. 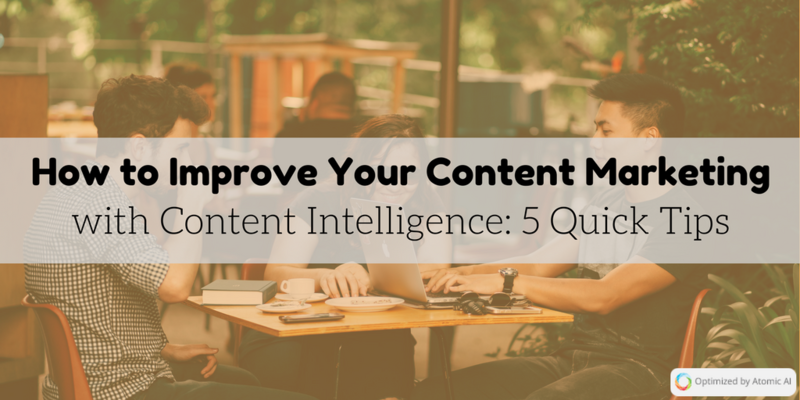 However, content intelligence helps you get over this challenge by recommending topics based on the performance of your existing content pieces inside your content inventory. Not only that, content intelligence can also surface insights on what content your competitors are creating and what they’re doing differently. Moreover, content intelligence tools can also guide you to create content based on your specific marketing goals, e.g, more pageviews, higher sign-ups, more traffic and so on. In 2014, Mark Schaefer famously coined the phrase “Content Shock” which essentially meant content marketing could reach a dead-end unless it stood out and offered any unique value. Indeed, if content marketers continue to create generic content without even exploring how it fits their target audience, sooner or later, they’d end up contributing to the so-called content shock. Fortunately, the AI and big data have redefined the way content marketers would approach content creation and distribution. Content intelligence can help marketers create personalized content that meets the pressing needs of their niche audience. This results in better engagement and more importantly, a better content ecosystem. Indeed, early adopters of content intelligence technology can have a competitive advantage, by staying steps ahead of businesses that still offer non-personalized content to their audience. Content intelligence is the new frontier in the content marketing world, which promises to solve daunting challenges, offer actionable insights, and make B2B content marketing more intuitive than ever. If you’re a business that revolves around customer perceptions and brand loyalty, incorporate content intelligence into your marketing strategy for a thriving future. Susanta Sahoo is founder and chief content marketing strategist at Top League Technologies, a digital marketing start-up in Bhubaneswar, India. By offering SEO consulting services, he helps SMB’s build their online presence and boost ROI. Follow him on Twitter: @ugosus. Michael is the Content Strategist at Atomic Reach, a content intelligence platform used by marketers to generate more leads from their text-based content. He is on a mission to empower marketers with actionable data so they can make more informed decisions about their content strategy.